Mulk directed by Anubhav Sinha starring Taapsee Paanu was critically praised last year and was a certified hit. After the commercial success of Mulk, the master duo is again collaborating for Anubhav Sinha’s next “Thappad” which is said to be real-life incident on socio-political drama. Taapsee who made her way in the Bollywood industry without having any godfather or through nepotism. She has worked hard to reach her way up and with her acting skills left the audience spellbound. As she has excelled every character she has played and not even in a single it can be said someone else could have portrayed the character better. These two beautiful girls.. they always got it right. Always.. #MULK #MakingOfMulk Running in a theatre near you. As per the reports of Mumbai Mirrors, Thappad will be shot in Delhi and will go on the floors in August. Director Anubhav Sinha apparently decided to cast Taapse in his next during the shoot of Mulk. Taapsee will play the character of a middle-class girl in the film. Thappad is commended to be a women-oriented film. 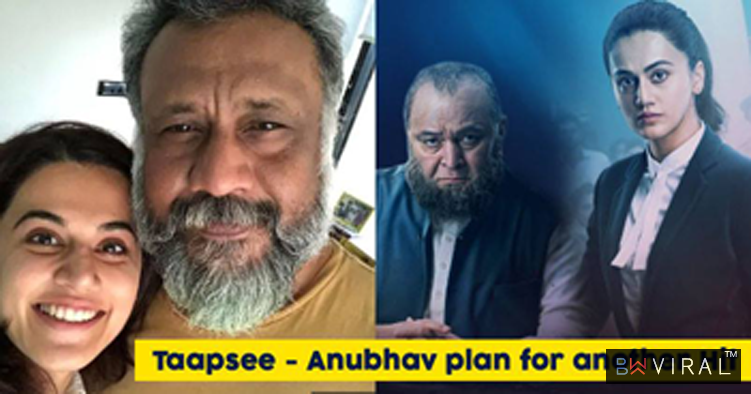 According to reports, Anubhav is planning to release Thappad next year on International Women’s Day weekend.